I may or may not be obsessed with the concept of stuffed avocado. It’s just fun, and cool, and of course, delicious. You may have seen me on Snapchat (@asimplepantry) last week when I made a super simple garlic shrimp stuffed avocado, and again this morning as I made this breakfast right here. It’s full of my fave southwest flavors, so it seems only fitting to call it Southwestern Stuffed Avocado. It sounds a lot more appetizing than the plain ol’ egg stuffed avocados I was calling them on Snapchat. I wasn’t being terribly creative at the time with my words. It happens. So sue me. But don’t actually, OK? OK.
Really, the true secret to keeping this a fast and easy recipe that tastes amazing is using my fave pantry staple: HERDEZ® Salsa. Like, hello, delicious. Please say that with a valley girl accent. Please. It’s just how it’s meant to be. Between the eggs, tomatoes, Queso Fresco, and refreshing cilantro, just has to be muh favorite salsa. Pretty much no meal is complete without it. Truly. We like to keep our flavors authentic, just like HERDEZ®, so whipping up a fun and nutritious meal that the kids absolutely love? Huge win. Especially with Día Del Niño approaching! How do you celebrate with your kids? Do you get them all up in the kitchen having fun and making messes while learning to cook? If so, you might totally love this giveaway, which you should check out right meow. Do it. Do it. And when you are done, you should come back here and make this southwestern stuffed avocado. And then eat it. And then repeat, because it’s awesome. 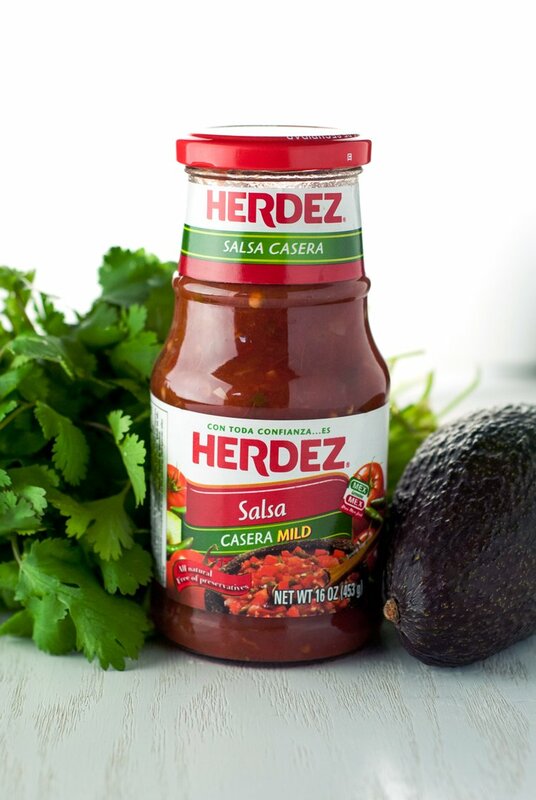 What is your favorite way to use HERDEZ® Salsa? Tell me about all those amazing dishes, and be sure to check out my 5-Ingredient Chicken Enchiladas using the Salsa Verde! Easy, delicious, wonderful meals FTW! Spray a frying pan with cooking spray and heat over medium low. Whisk the eggs vigorously in a small bowl for a minute, then add to the frying pan and scramble gently until done, around 7 minutes. 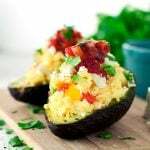 While the eggs are cooking, cut the avocado in half, discard the pit, and use a spoon to scoop out the insides of the avocado, leaving about 1/4" of avocado around the edge. Dice up the avocado and gently toss it in a bowl with the tomato and queso fresco. When the eggs have finished cooking, add them to the the bowl with the avocado, tomato, and queso fresco, stir, then divide between the two avocado halves. Top with the cilantro and salsa, season with salt and pepper if necessary, and serve immediately. OMG ! this looks so yummy ! 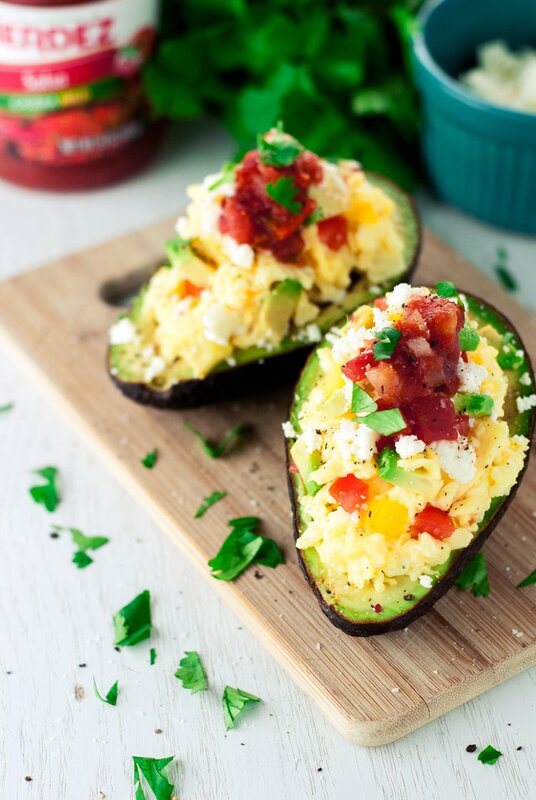 Karly--eggs and avocado are a fabulous combo. And I love that you added Herdez sauce--they have SO much flavor! I could eat this for breakfast every morning! I usually have avocado toast with an egg on top. I love eliminating the toast and stuffing everything into the avocado. Cant wait to make this for the whole family. My kind of breakfast! - and completely suitable for the diet my husband and I are on now! Love it, thanks! I love avocado for breakfast. 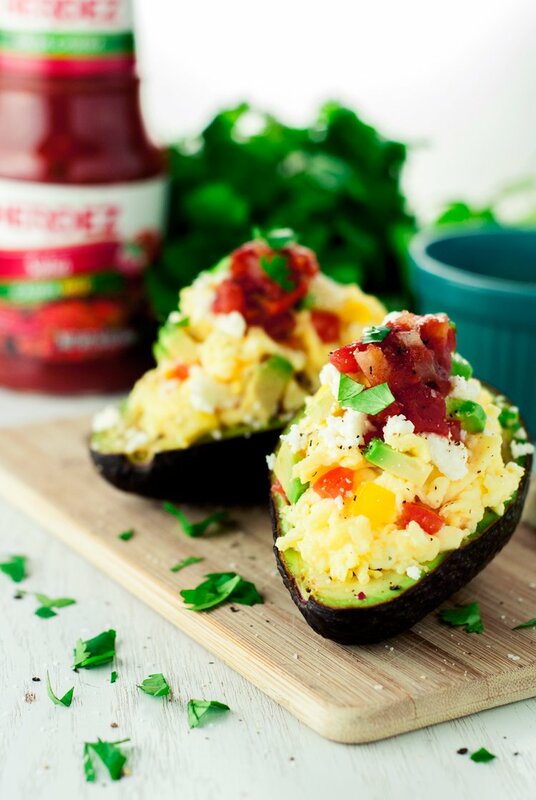 I'll eat them plain or with eggs stuffed into a tortilla, but who needs the tortilla when you can use the avocado! I love this idea! 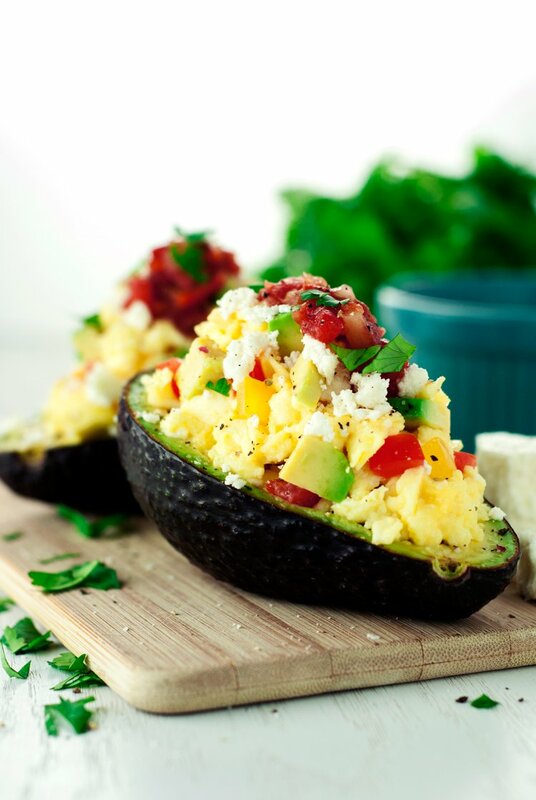 Avocado and eggs go so well together, and all that protein and healthy fat would keep me full all morning. Can't wait to try! I came over on another thread but I pinned this recipe because it looks so delicious and your photos are beautiful! Awesome recipe! What a great meatless option. 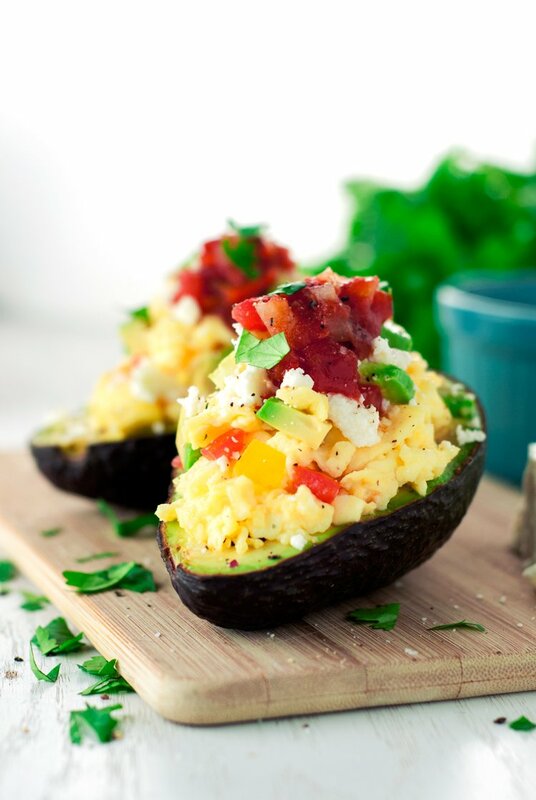 I love avocados - any time of day - and this breakfast dish looks amazing! I live in south Texas now (only 7 months), and the avocados are so inexpensive and I can always find ripe ones. I'm pinning! Well howdy, neighbor! Welcome to South Texas! LOVE avocado with anything ! Your recipe would also be perfect as a light dinner with a crunchy salad!